What a brilliant idea! 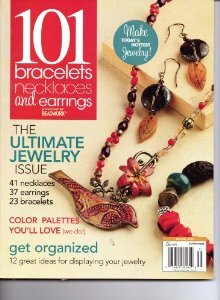 101 Bracelets, Necklaces, and Earrings, a special edition by Beadwork, has all the projects arranged by color! Over all, you can think of this as a color issue. Now that's not to say that you must make the pieces in the colors shown, but the volume is definitely geared towards beginners, who sometimes want to be able to make exact copies of certain projects before venturing off into substituting I don't think you'll be disappointed if you are a beginner: there's a wide range of styles and materials contained here. Resource information is included and projects are all intended to take only a couple of hours tops to complete! You can pick up your own copy on the newsstands until mid-October.